Fear of Dreaming collects all of Carroll's poems from Living at the Movies and most of The Book of Nods. 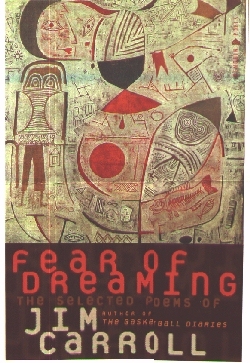 While some of the poems originally published in TheBook of Nods are not included in Fear of Dreaming, one of the "New YorkCity Variations" originally left out of The Book of Nods can be found on page191 of Fear of Dreaming; this piece was originally published in Paris Review in 1985. In addition, the final section of the book, "New Work 1989-1993,"offers fifteen new poems and prose works. Among these are the short story "Curtis'sCharm" (which first appeared in Paris Review in 1993 and was adapted to film in 1996 by Canadian director John L'Ecuyer), and the poems "Fear of Dreaming," "Praying Mantis," and "To theNational Endowment for the Arts." The second edition of Fear of Dreaming contains substative changes and corrections to "Curtis's Charm." In the first edition, an overzealous editor changed the term psycho-noetic to psycho-poetic (p. 253); this has been corrected in the second edition. In the second edition, Carroll has also deleted the last sentence of the paragraph at the top of page 254: "If I did have a staff, however, I would neither break nor bury it, and as for the Magus books, I had no intention of drowning them."